Royals who lost to Chennai on the last ball of the match, will look to get back one in their home ground, where they have won all the three games played in their fortress Jaipur. 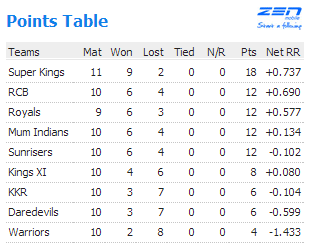 RCB having AB & Gayle in deadly form will like to continue their good run. Dravid won the toss and surprisingly decided to chase, interesting point to note, Royals have never lost a game, in which they have scored more than 160+… Which Dravid should of thought though before the call. RCB was slow of the blocks to get away, Gayle was unwell and Kohli opened along with Dilshan, but it didn’t last long though, 60 runs came up in 10 overs having lost 2 wickets. Unwell Gayle was trapped infront of the stumps, and two destructive batsmen in T20 cricket joined hands to demolish the end overs of Royals, both piled up 82 runs in last 5 overs, to finish with 189/3 in 30 overs. De Villers being the most destructive as he scored the fastest 50 of this season as well. in the Meanwhile Dilshan carried the bat through the innings with 76* and Dilshan AB de Villers with 59* of just 23 balls. Royals needing a tough chase, had a indifferent start, as Rahane looked more restricted and Dravid looked more fluent on both side of the wicket. Once again both Dravid & Rahane stitched a 56 runs partnership between them, Rahane left the crease after a shaky indifferent start for him. Dravid scored the first fifty of the season but run rate was keeping on to grow, pressure succumbed 3 more wickets quickly, Shah,Goswami & Dravid in order and K Appana being the lone wicket taker.Nothing much in the deep as they walked in with 15 required per over. 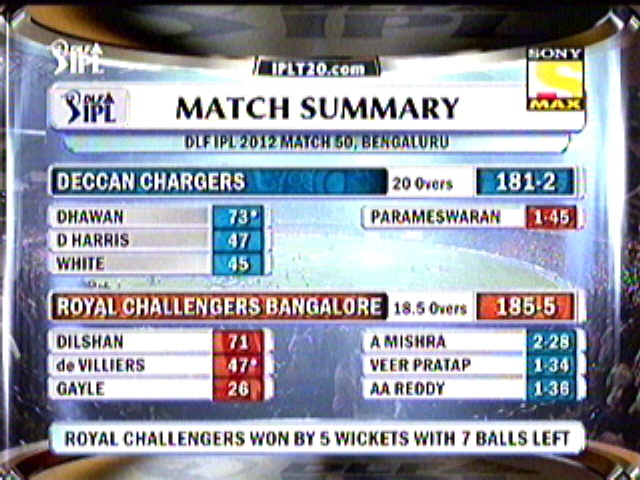 As Royals ended up with 143/7 in 20 overs. RCB won the game by 46 runs. – Kevon Cooper bowled the 12 Maiden of IPL 5. – Rahul Dravid scored the 6th IPL fifty. – Rahane & Dravid is the most successful opening pair for this season so far, as both have four 50+ opening stands between them. – 4/19 is the best T20 figures for K Appanna, he now also 9th Bowler for this season to pick 4 wickets in a match. – 19 runs given as extras by Royals equalled the top spot along with King XI, who offered the same to Rajasthan Royals in their opening game. – 46 runs victory is the third highest for this season, falling behind 59 runs by Rajasthan against RCB & 74 runs by CSK against DC. – 122* runs of partnership between AB de Villers and Dilshan is the second highest in terms of runs, they fall behind 131 runs scored by Gayle & De Villers for the same 4th Wicket against Kings XI Punjab. – De Villers scored the second fastest fifty of this season with 21 balls, list topped by 19 balls fifty from Owasis Shah. Longest Six – Chris Gayle – 106 Meters followed by Kieron Pollard – 105 Meters. Both teams languishing at the bottom of the table and who ever wins this will join the middle level battle of 6 pointers. Vettori won the toss and decided to chase for the day. With Gilly (Hamstring Injury) missing out David Hussey did the skipper job. As always KXIP had a poor start, as they were 2 down in no time, and score card was below 30 and five overs gone, Hussey & Marsh tried to resurrect the things around, Marsh failed earlier than expected, Hussey rode on luck for some time and eventually passing out to a inside edge on 41, New Entrant Azhar mahmood had a go at the end to get KXIP to a score of 164/6 in 20 overs. RCB got off to a dreadful start any would even dream off, they were 25/3 in 5 overs, Leaving Gayle & AB to do the job, KXIP felt it would be game if they can pick any one of the batsmen in the crease, but that’s what they failed to do, until both the batsmen put on a 131 runs partnership between them. Both played with elegance more than power, it was a delight to watch these as they picked the games in precision, and Gayle’s power was unleashed now and then to keep the run rate at control. KXIP struck late with couple of blows, and it was way over, and finally McDonald & Vettori finished the formalities to go up to 6 points in the table. along with 4 others with 6 points each. – Chris Gayle scored the 250th Six of IPL 5. – AB and Gayle scored their 7th & 8th IPL fifties respectively. – 131 runs partnership between Chris Gayle & AB de villers is the highest for any wicket, as they bettered 121 runs between Rahane & Shah. – Chris Gayle became the first to score third fifty for this season. – Parvinder Awana registered his best bowling figures in IPL 4-0-34-4. – This is the first match of this season to finish with 3 balls to spare; we already have 2 each for 5 & 4 balls finishes. Thanks to Brad Hodge & Chris Gayle being the starts who won the game for their sides Rajasthan & Bangalore respectively. 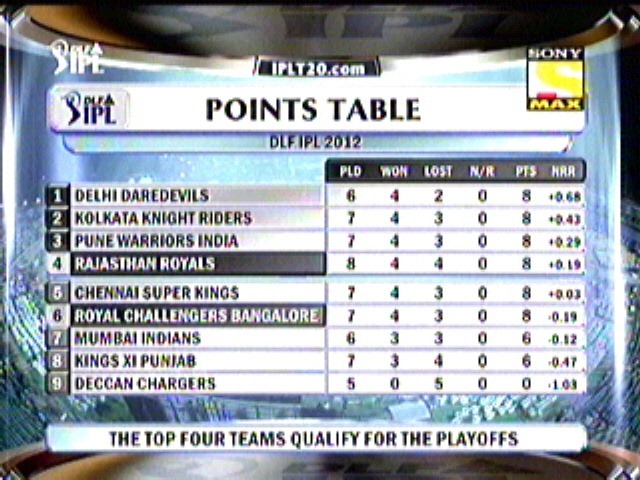 – 62 runs of first 6 overs scored by Rajasthan Royals is the highest powerplay score for this season. 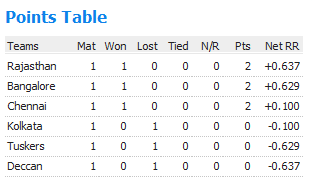 – 50 runs of 4.5 overs is the fastest team fifty of this season. – Brad Hodge scored the 200th Six of IPL 5. – 31 runs scored of Rahul Sharma’s over by Chris Gayle is the highest runs scored in a single over, he bettered Morkel’s 28 runs. – 393 aggregate runs scored between Rajasthan Royals Vs Deccan Chargers is the second highest, falling behind 413 runs by CSK Vs RCB. – Rahane became the first to go past 300 runs for this season of IPL. – 8 sixes scored by Chris Gayle against Pune is the highest no.of sixes hit by a batsmen in an innings for this season, he toppled his own record of 6 sixes against Chennai. – Amit Singh took over from Gony as the worst bowler of this season, by conceding 55 runs in his 4 overs, where Gony gave 1 short of the same. Its evergreen Warne Vs New deputy Sangakarra for Deccan’s. Warne won the coin and decided to field first, Dhawan who played for Mumbai last year opened along with Jaggi, to say they gave Deccan’s a good start by scoring 40 in first 5 overs, Skipper Sanga failed as he went for a 3 ball duck, from then on Warnie kept spinning his magic wand around the Deccan’s and they never seen to out of the jinx. Few Lusty blows from Million Dollar Man Dan Christian and Ravi Teja took them to 137 in the allotted 20 overs. Warne would be very much proud to restrict DC’s for such a low score, without doubt 20-25 runs less in a good batting pitch. DC 137/8 in 20 overs. RR 142/2 in 18.5 overs. RR WON THE MATCH BY 8 WICKETS. Kochi makes their IPL debut against last year semi finalist RCB’s, Mahela won the coin and decided to bat first in their home ground against Vettori’s RCB. All as of now know Kochi has stacked more bowlers than Batsmen, but it didn’t look of that sort as McCullum and Laxman tore apart the RCB’s Bowling in ease, esp they took out Zaheer and Dirk nannes. By the end of powerplay they went past 61/0. Once Laxman holed himself out in the deep midwicket, McCullum produced a another poor T20 Scoop to get himself out for 45. Which put on the brakes on the scoring and few late strikes from Jadeja took them past 161 in 20 overs. KTK 161/5 in 20 overs. RCB 162/4 in 18.4 overs. RCB WON THE MATCH BY 6 WICKETS. Before start it looked Kochi would pull of their IPL victory, after they removed Dilshan for just 1, but their poor bowling and choice of bowlers in rotating by Mahela costed them their first victory and not to leave few fantabulous batting display by AB de Villers got them past the RCB’s over the victory line comfortably with 8 balls to spare. Bowling Just sorry figures for all, just a forgettable opening performance apart from McCullum assault in the beginning. Will look fwd to better fight in future…. – Ross Taylor scored the 50th boundary of the IPL 4. 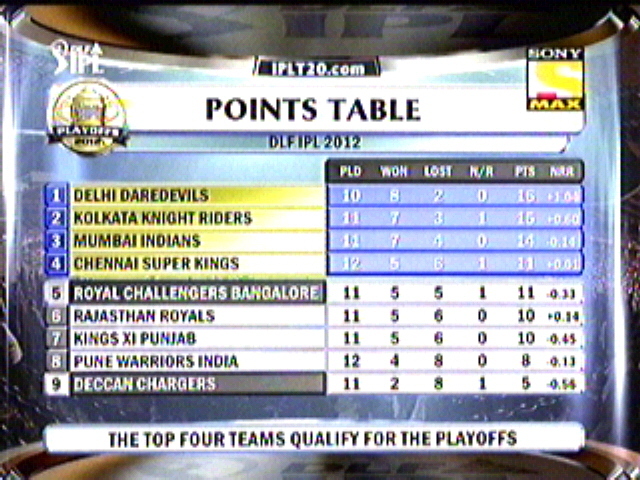 – Sangakkarra became the first victim to be dismissed for duck in this season of IPL 4. 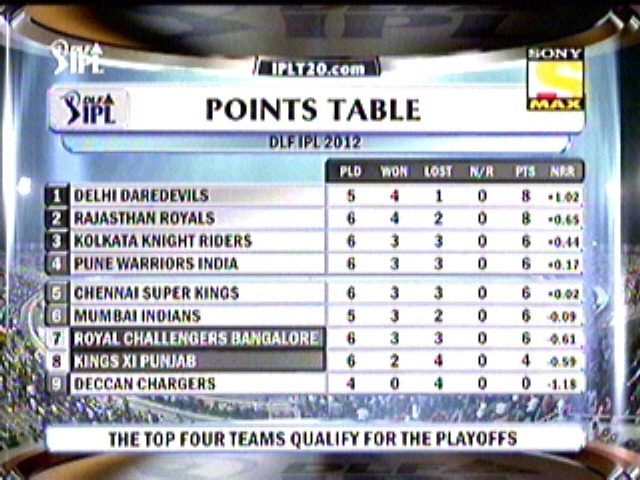 – Deccan’s yet to win a game in their home ground. – Gomez (KTK) became the first batsmen to go for golden duck of IPL 4. – Sreesanth picked the first wicket for KTK and its Dilshan. – AB de villers scored the 25th six of IPL 4. – Brendon McCullum scored the first runs for the KTK. 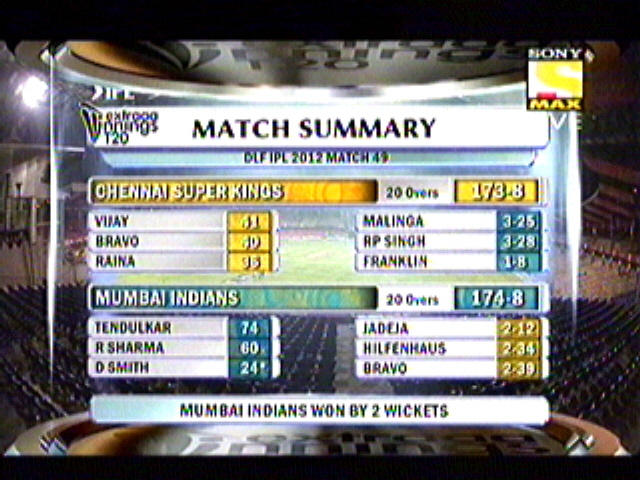 – Both the matches for the day was won by Chasing and comfortably ending in the 19th over. Orange Cap – J.Botha (67) followed by Anirutha Srikanth (64).